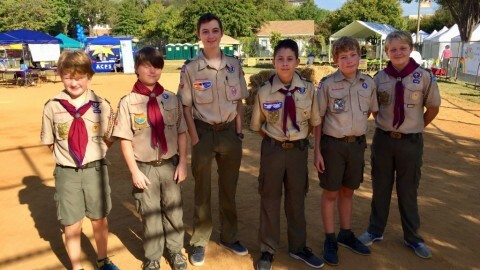 As a service to the community (and to help scouts earn service hours for advancement), Troop 131 will be leading the Scarecrow/Kids area at this year’s Art on the Avenue event in Del Ray on Saturday, October 7th. Here’s some background information about this annual multi-cultural arts festival. And here’s a festival map. This should be a really fun event. Our service hours will take place over two days. Sunday, September 24th (2:00p – 4:00p) – We will need 12 scouts to help with flier distribution in the Del Ray neighborhood. We’ll meet in the Pat Miller Neighborhood Square on the corner of Mt. Vernon Avenue and Oxford Avenue (the location of the Delay Ray Farmers’ Market). Saturday, October 7th (6:30a. – 7:30p.) – We’ll need Scouts to sign up for time slots throughout the day for Art on the Avenue. Our service should be fun and pretty easy. We’ll be helping kids build scarecrows at the baseball field at the Mt. Vernon Recreation Center with bales of hay and donated clothes (if your family and/or neighbors have any old clothes they’d like to donate, that would be great). As a way to raise some funds for the Troop, after kids have built their scarecrows, we’ll also offer a wagon delivery service to their house for those who live close. To do this, we’ll need a few wagons. If you have one you could bring, please let SPL Brendan Leary know. Please sign up for a time slot or two using this sign-up form. Please remember to wear your Class A uniform for this service project. If you have any questions or need more information, please contact SPL Brendan Leary at (703) 508-9131 or Brendan@Leary.org.